Mock jurors get paid to participate in mock trials. This is just extra money, and sometimes your chances of getting picked will depend on your geographic location and other factors. 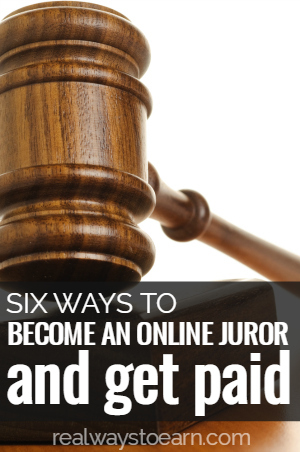 Below is a list of a few different sites that have an occasional need for mock jurors. Jury Talk – Signing up as a Research Juror for their one day legal focus groups and mock trials. Online Verdict – US only. Earn extra money reviewing legal cases from the comfort of your own home. Resolution Research – Resolution Research recruits individuals for mock trials from a wide variety of educational, financial and social backgrounds in order to reflect the potential juror population for a case. One problem with doing this is that it's not consistent. You'll have no idea when you'll get opportunities to participate in mock trials. If you're looking for other ways to earn extra cash where there is no shortage of things to do, I highly recommend Swagbucks. I've been a member here since 2007 and I've been paid several times. You can earn here by doing paid surveys, watching videos, playing games, listening to music, and more.